I try to visit Bruce Piermarini’s studio at least once each year. He builds swimming pools in the summer and paints in the winter, so I usually go in the spring to see his new work. I have been doing this since the middle 1980’s. He never disappoints me, and, what is much more, he always dazzles me with his wild energy and newness. Every inch of every wall of his studio, which is 30′x40′ with a 13′ ceiling, is hung with new works, large and small. Fiercely frenetic, they leap out at you from every direction. Even experienced lookers can be disconcerted or put off. At first glance, Piermarini’s enormous energy and extraordinary consistency can count against him. Only when you make a conscious effort to isolate each individual painting, do you see how very unique, sophisticated, and intensely felt, each one is. And only then, returning to the general aspect, can you surrender to his madness and embrace his passion. He comes on like a tidal wave or some other awesome force of nature. Like all true creators, Piermarini obeys an inner necessity, an inner self, and transcends the solution of problems already posed. To be himself, he must be new. Piermarini was born and grew up in Leominster in Central Massachusetts. He is the oldest of 6 children. Among the early experiences that help shape his outlook was working in a factory after school pouring molten plastics into moulds. He also played in a rock band as well as a marching band, and can play the organ, the saxophone and the harmonica. Piermarini enrolled at the School of Visual Arts in New York in 1975. 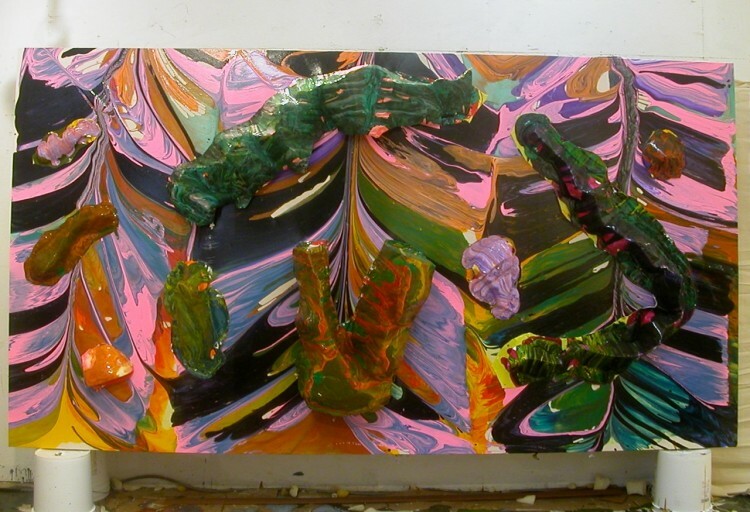 There he studied with the Color Field painters Dan Christensen, Larry Zox and Ronnie Landfield. But he was most drawn to the styles of Morris Louis and Larry Poons. Between 1978 and 1980, he was a graduate student at the Maryland Institute, College of Art, in Baltimore. There he was influenced by Salvatore Scarpita, a conceptual artist, and did a number of amusing conceptual pieces, like exhibiting a canoe which had been crushed by a steamroller. After receiving his degree, he returned to Massachusetts and came together with those painters who later would become known as the New New painters. New New painting is the latest chapter in the history of modernist painting, and more particularly, post WWII modernist painting. Basically, New New is Abstract Expressionism and Color Field painting, plus many of the purely visual effects of Pop Art made possible by technological developments of acrylic paint. In other words, Modernism plus Postmodernism. Color Field was the dominant style when the New New painters were students. They fully absorbed it, and then, went in the opposite direction, turning back to Pollock and Abstract Expression. Thanks to his temperament, intelligence and training, Piermarini quickly understood what was happening. and became one of the group’s most outrageous members. He has never looked back or let down. He recharges Color Field painting with an all out, full blast expressionism, “primitive”, raw, rough, firey, obsessive and aggressive. More than any of the others, Piermarini courts chaos, often conveying a near out of control, demonic energy. He wants the brightest and most intense color, the most dramatic drawing and composition, the thickest most viscous paint and a bursting three dimensionality. The latter, the sculptural, already appears in his work of the middle 80’s which show large sheets of foam affixed to the surface. These create a powerful, churning, undulating movement which breaks out of, and overwhelms, the rectangle. But Piermarini had to solve the technical problem of making the paint adhere to his large foam pieces. He worked with the paint chemist Mark Golden to develop a gel which would seal the foam and bind it to the picture. By 1999 Piermarini had what he needed. Also at this same time, he began to use a lot of black and white. These pictures have a power and mastery greater than before. Many of them recall Fernand Léger, one of Piermarini’s heroes. They show multiple, large, irregular shaped chunks of foam projecting a foot or more from the surface. 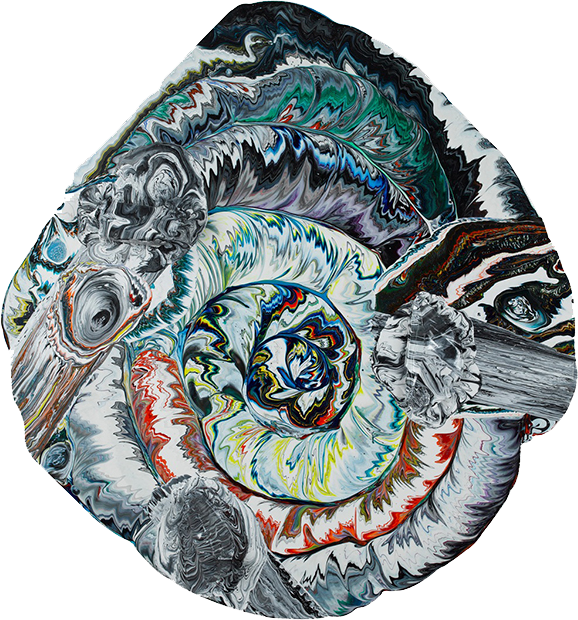 They prompted the painter, Graham Peacock, to call them the “Flint Stone Paintings”. They certainly push to the very limit of how aggressively three dimensional a picture surface can become, and still be seen as a painting. Frank Stella already had tried to do something like this beginning in the 1970’s. But Piermarini has far more feeling for paint, color, and pictorial values, than Stella ever had. (Indeed, Stella is most at home with relief and three dimensional sculptures.) After 1980, Larry Poons used light materials like foam to give a rugged surface over which ran down streaming skeins of paint. These surely influenced Piermarini. But Piermarini’s relief paintings, starting in the late 1980’s, were far more aggressively sculptural, while, at the same time, showed bright color contrasts unlike Poons’ which were mostly in neutrals, browns and greys, or pastels. 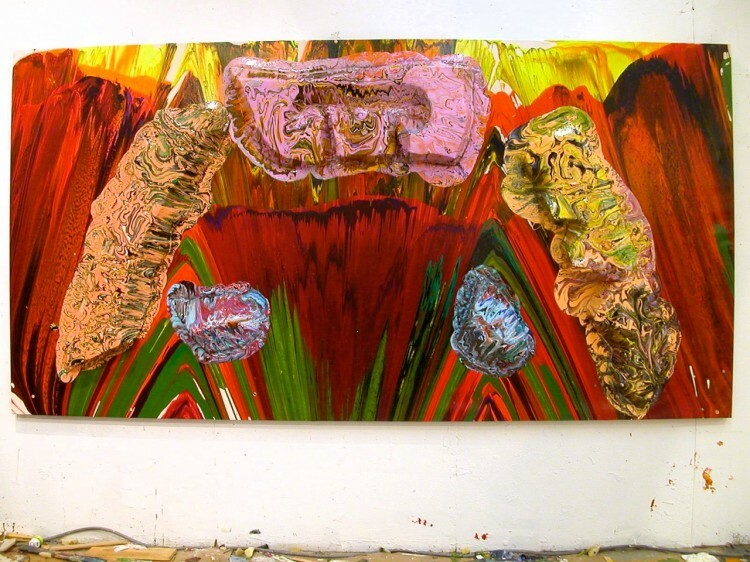 The only other painter who has been this daring with heavy relief is Bram Bogart, the Dutch painter who lives in Belgium. In comparison to Piermarini’s, Bogart’s works are more physically and expressively massive, with their dry, heavy, concrete-like look. Bogart uses his own self devised (and secret) medium. Piermarini uses acrylic paint, and plastic foam; the results are lighter, buoyant and, with their shiny surfaces, seem very like ceramic. Also, Piermarini’s color is more direct, limpid and varied. But both Bogart and Piermarini are among the most creative and consistent masters of our time. 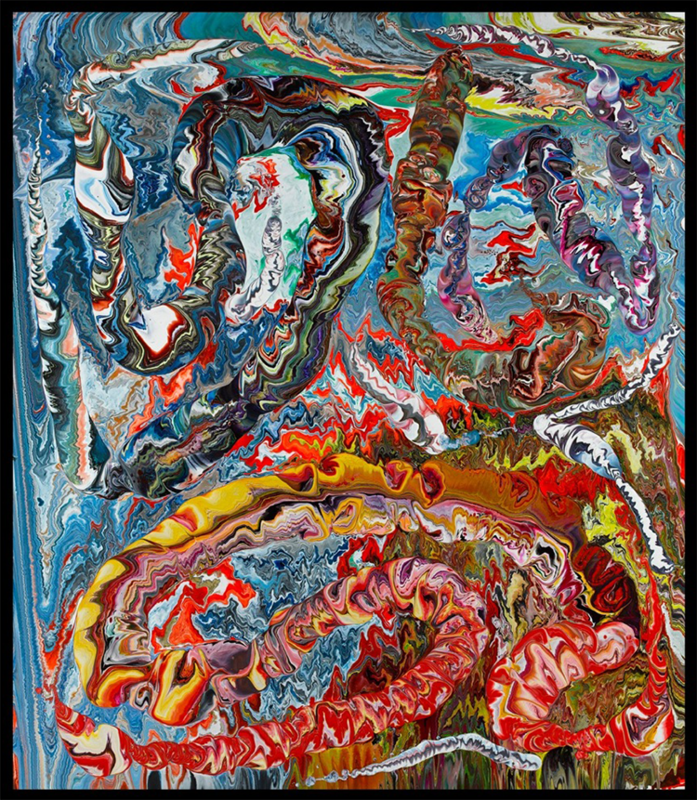 In 2007, Piermarini saw the paintings of Peter G-Ray with their brilliant use of poured illusionism. 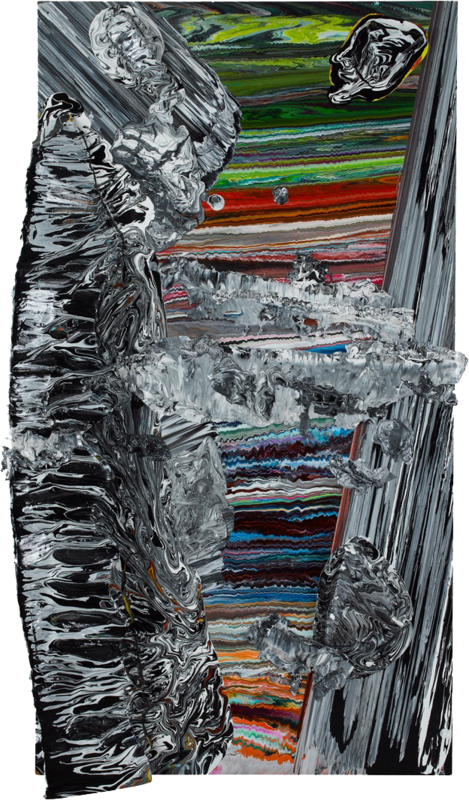 Temporarily, Piermarini abruptly abandoned his quest for the limits of literal, three dimensionality and began creating his own version of poured illusionism. Actually, this was not as big a change as it may seem. Following Pollock, and especially Morris Louis, Piermarini had been pouring paint on a large scale since the 1980’s, and so, was immediately able to see his own possibilities in Ray’s pictures. And Piermarini’s version of poured illusionism is very different from Ray’s. 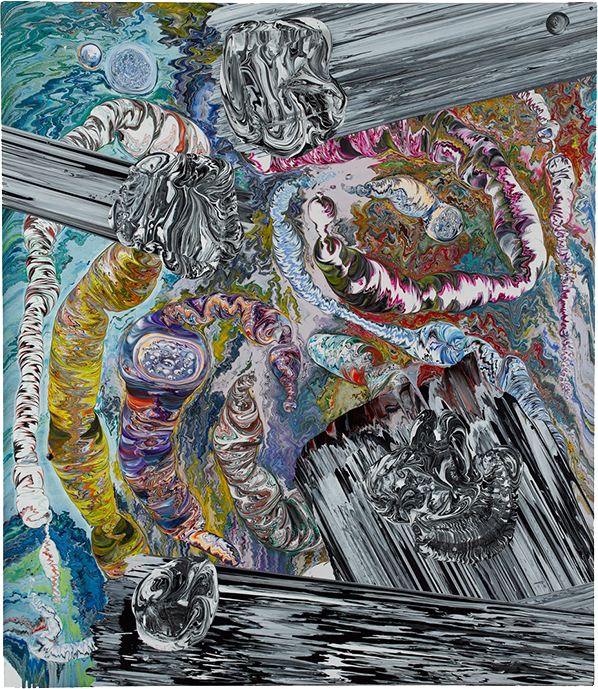 The latter uses oil plus acrylic and his pictures are therefore darker and denser than Piermarinis’, which are painted with acrylic alone, and are therefore lighter and more buoyant. Also, Ray is, at heart, an easel painter as regards scale, while Piermarini, ever the rival of Louis, here again shows his mastery of large scale. Piermarini’s surfaces were now flat but full of depicted, coiling, twisting, squirming forms, set against a distinct, but also quickly flowing, backgrounds. There is modeling, foreshortening, and dizzying spaces. They evoke both the visceral and the geological. Each freezes a magnificently orchestrated, wholly improvisational, yet completely natural, event. Each is free, yet precise, commanding, yet with the most exquisite details. If color is no longer as out front as in his previous work, now being subordinated to illusionism and handling, Piermarini is here able to use many more colors, and even many different color chords, within each single picture, something truly new to abstract painting. In his 2011 pictures, he has begun to reintroduce three dimensional forms merging these seamlessly into his poured illusionism. And in certain examples, the whole picture seems to warp and twist to even dizzier effect. In many ways these paintings were Piermarini’s most amazing yet. They are certainly his most articulated, and refined. Basically, he has added Surrealism, especially the hallucinatory effects of Salvatore Dali, to his repertoire; and he has done this without interrupting his pursuit of Poons and Louis. 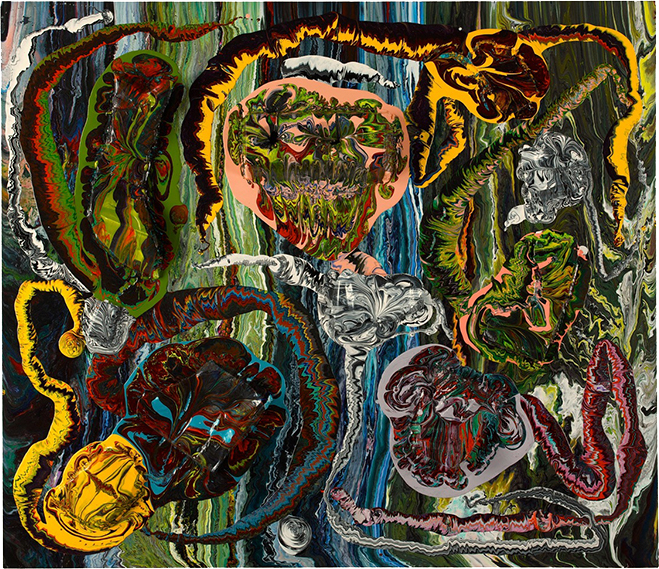 The most striking feature of the new paintings is their stupefying virtuosity and hyperactivity. Piermarini’s next works were two groupings of narrow, upright, rectangular panels (actually hollow wooden doors of different widths) each painted separately and arranged edge to edge, together constituting a 24ꞌ and a 26ꞌ long “picture”. Each panel shows abutting, squirming pours of paint. Everything is foreground and seem successive, horizontal like, rolls or waves of liquid, with occasional small circular poolings. The rolls don’t align exactly, but only more or less, which adds to the wholly original dynamics of the “picture”. They are very direct and very fluid. Indeed they might be said to be the most fluid of what Graham Peacock has called the “fluid school”. 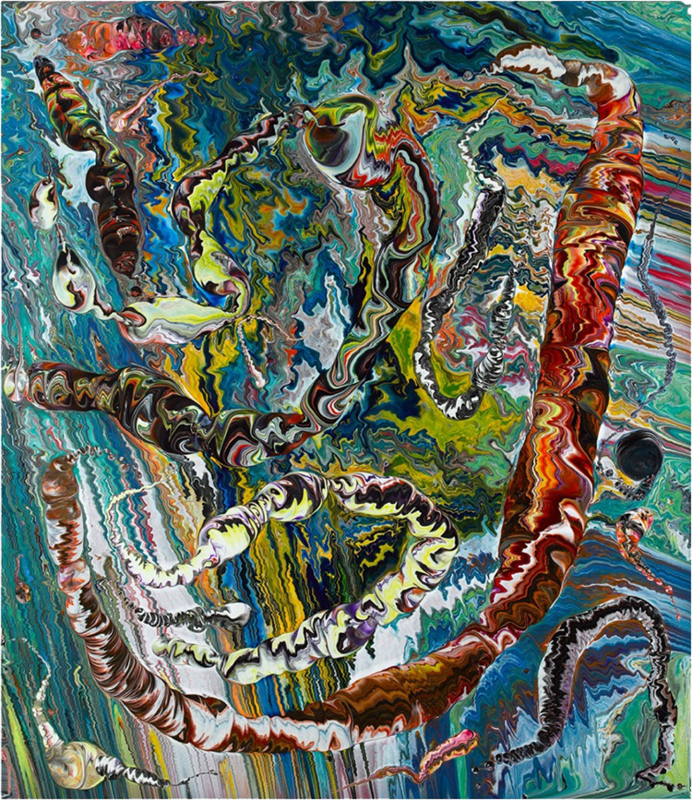 Inspired by Pollock, certain masters have devised unorthodox ways of working on a large scale with paint handled as a fluid substance: Helen Frankenthaler, Morris Louis, Larry Poons, Graham Peacock and others. 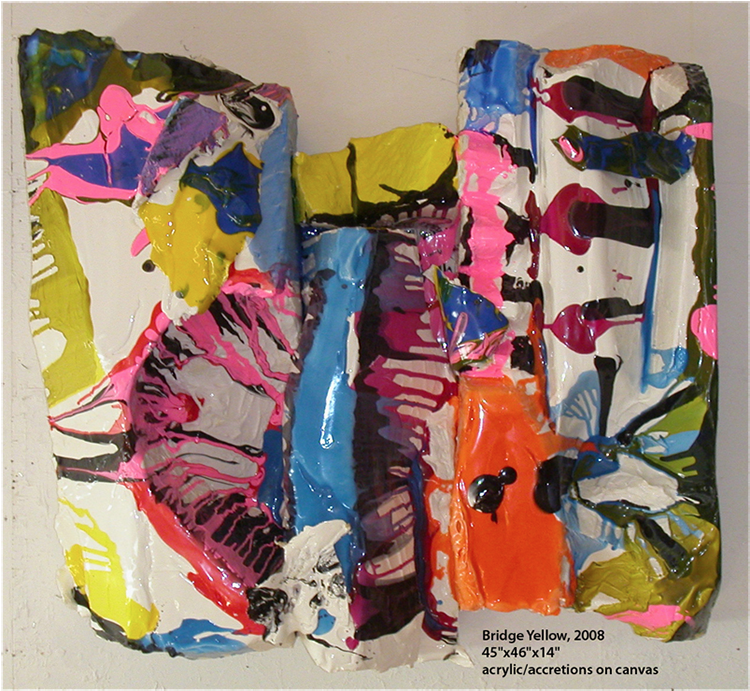 Bruce’s recent work is in this tradition and this year’s two big works seems the most fluid of all. The pictures virtually flood into the room. They are also illusionistic, entrancing and seemingly infinite in their colors and details. The use of multiple upright panels making up a single pictorial event was first used by Friedel Dzubas and later by the New New painter John Gittins. It offers unique challenges and possibilities. 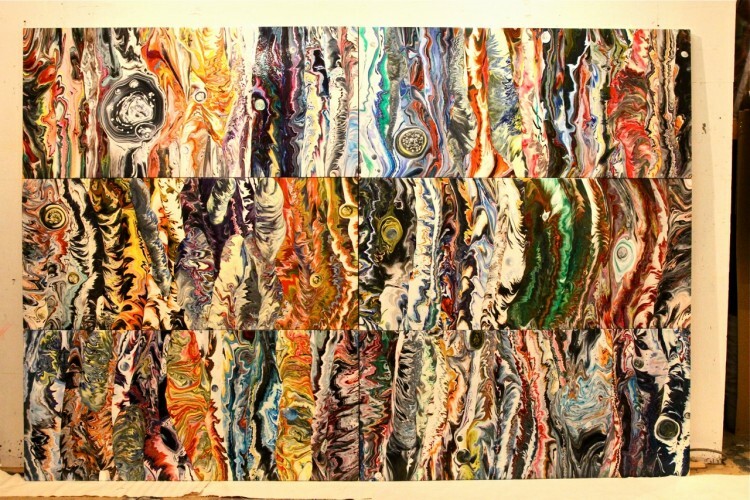 Most challenging, at least for me, is one ensemble of this group, “Recumbent Moons”, where the rolls or waves of poured paint are set vertically, which permits both horizontal and vertical extension. The effect is of a dense forest of trees, or columns or of a waterfall but, cutting through the middle, are two, crisp, horizontal creases. As usual, Piermarini here pushes his idea to its absolute limit (and possibly beyond). Up until now, Piermarini could be called a “series painter”. Each winter’s output had a distinct identity. But this year, he has attained a new level of control. Now his many acquired ways of working are part of a broad vocabulary which he employs differently in each picture. As a result, each picture is more unique in conception and more distinct from all of the others. Here is the height of supreme mastery. 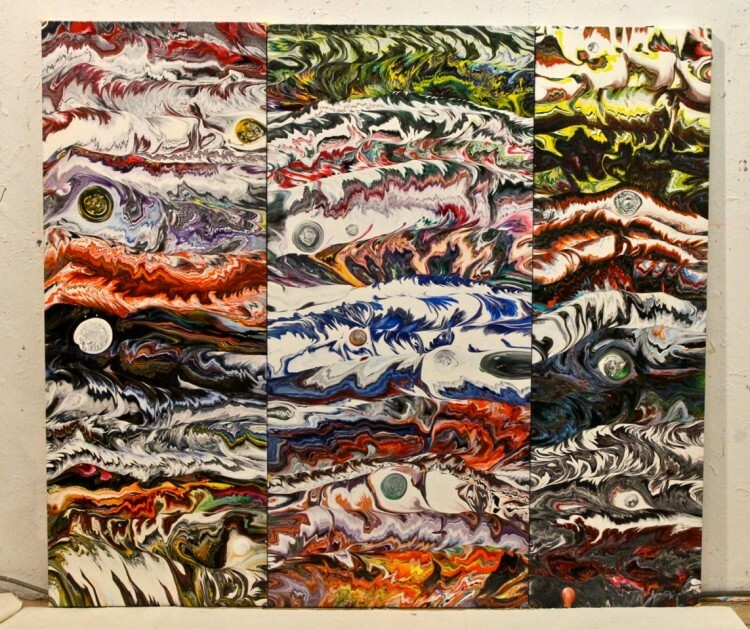 But like his earlier efforts, Piermarini’s new pictures have the same go for broke expressionism, the same fiery obsessiveness, the same demonic energy.